...on pampers, programming & pitching manure: Holy Hockey Sticks! 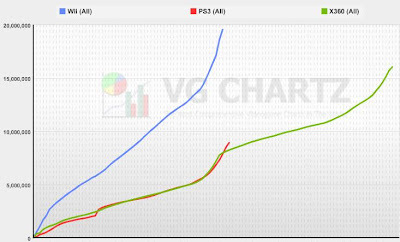 For all the poo-poo'ing of the PS3 (I'm as guilty as anyone), you have to give them credit for chugging along and selling units as well as 360 did through launch, despite being last 'next gen' console to the party. Nintendo's graph is, well, phenomenal. For them anyway. Whether it's good for *games* in general is debatable. They get credit for tapping the untapped segments of the market, but I still agree with Chris' rant on the console's shortcomings.